Researchers are preparing a large scale clinical trial of the controversial drug, thalidomide to help fight lung cancer. Thousands of children were born with defects during the 1950s and 1960s because their mothers were given the drug to prevent morning sickness. But doctors believe the drug could be used to help treat lung cancer which kills nearly 35,000 people in the UK every year. The Cancer Research UK-funded trial is the third stage in tests on a thalidomide and chemotherapy treatment for Small Cell Lung Cancer - a notoriously difficult type of lung cancer to treat. Around 400 patients will be recruited to take part. The trial will be led by Dr Siow Ming Lee, of University College London, who believes thalidomide stops new tumour blood vessel growth, has immune stimulating properties against cancer cells and stabilises existing blood vessels. "Results from earlier tests have been encouraging," he said in a statement. "The outlook with existing treatments for small cell lung cancer remains poor - this is why we must look for innovative methods of treating the disease." Thalidomide was taken off the market four decades ago after causing severe birth defects in children. It was used as an anti-nausea drug for pregnant women until doctors realised it was causing limb deformities in unborn children by limiting blood supply. Researchers acknowledge the public fears over the use of the drug but say any treatment to combat lung cancer would be a great benefit. Thalidomide is sometimes used for other illnesses, including a cancer of the bone marrow and a form of leprosy - but only after extremely tight controls. 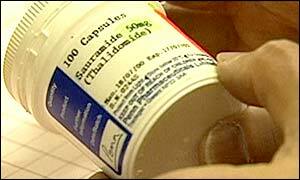 The Thalidomide Society, which helps people impaired by the drug, accepts it will be used more in the future. But it says there must always be strict monitoring and guidelines to ensure that there are no more thalidomide babies. Sir Paul Nurse, chief executive of Cancer Research UK, said: "The use of thalidomide offers us scope for optimism, any improvement we can get on the existing survival figures would be very welcome news." "It may help to prevent the spread of lung cancer"